Vinod Khosla: Pursuing technologies "that others don't think are possible"
With a little help from his powerful friends, Vinod Khosla is out to reinvent the internal combustion engine. The 54-year-old venture capitalist from Silicon Valley has a knack for putting technical superstars in the same room with wealthy investors and letting nature take its course. Last week he signed up old chum Bill Gates as an investor in his tiny Michigan company, after introducing the billionaire to the startup's president, Don Runkle. Runkle, the former General Motors and Delphi technical executive, said the engine that EcoMotors International is developing can be a game-changer. Its modular design features opposing pistons that fire against each other instead of a head, reducing weight, boosting efficiency, requiring fewer parts and slashing costs. As a renowned gearhead, when Runkle talks technology people listen. Still, Khosla, a stickler for detail, took it upon himself to coach Runkle on how to make a pitch to Gates at an entrepreneurship summit that Khosla Ventures put on in California in May. Khosla, whom associates describe as quiet but insistent, advised Runkle, 65, on how to make the PowerPoint presentation pithy and bright, suggesting that no slide contain more than 25 words. "Vinod told me that I had 15 minutes to give them my best shot," Runkle said. Runkle later went to dinner with the Microsoft co-founder to go over additional details. All went well. Last week Khosla and Gates announced that Gates and Khosla Ventures were purchasing $23.5 million in Class B shares of EcoMotors to accelerate developments at the 2-year-old company. "I've known Bill Gates for 20 or 30 years," said Khosla, who co-founded Sun Microsystems in 1982 and was CEO for two years before becoming a venture capitalist. "He looked at the project [EcoMotors], and his technical team felt it was viable." Also at the conference was one of Khosla's newest associates: former British Prime Minister Tony Blair. Blair, long vocal on global warming issues, joined Khosla Ventures as an adviser. His job is to introduce clean-tech companies in Khosla's portfolio to world financial and political leaders while steering the companies through regional red tape. 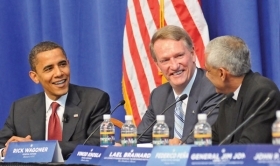 At a 2008 economic conference in Pittsburgh, from left, Democratic presidential candidate Barack Obama appeared on a panel with General Motors CEO Rick Wagoner and entrepreneur Vinod Khosla. Khosla Ventures has 5 startups working on technologies for the auto industry. So far none has made a sale. Khosla, who grew up in New Delhi, India, started Khosla Ventures, of Menlo Park, Calif., in 2004. The company holds a diverse portfolio of about 80 information and clean-tech companies, most in startup mode. Five, including EcoMotors, are developing technologies for the auto industry. Khosla Ventures owns 47 percent of EcoMotors. Gates owns 15 to 20 percent, Runkle said. 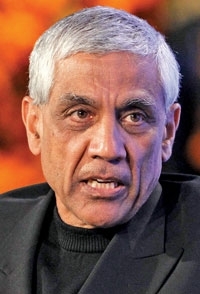 In an interview last week, Khosla said he looks for technologies that are prospective game-changers in their industries. Examples include EcoMotors' engine -- which it calls "opoc," an acronym for opposed pistons-opposed cylinders -- cement derived from emissions from coal-fired power plants and crude oil made from biomass, such as wood chips. In all cases, Khosla wants the eventual commercial product to be affordable throughout the world. "We're spending on technologies that others don't think are possible," he said. Khosla said the EcoMotors' engine presents one of the lowest risks of all the companies in his portfolio because of its simple design and use of standard parts already available in the automotive supply chain. "I believe it has lower risk and more upside than a new hybrid drivetrain," he said. The engine was conceived by Peter Hofbauer, former head of powertrain development at Volkswagen AG. Hofbauer is chairman and chief technical officer of EcoMotors. The radical design puts four pistons into two piston cylinders. Runkle said the engine is half the weight and size of a traditional one, with the same power. It has 62 parts, compared with about 385 for a conventional four-stroke engine. Runkle said the smaller engine could cost 20 to 25 percent less than a conventional engine. So far EcoMotors has built only five engines. Runkle said the $23.5 million infusion will be sufficient to complete the engineering and testing of the engine. He said he has been given no strict timeline to commercialize the technology. At GM, Runkle was vice president of the advanced engineering staff, among other things spearheading the company's EV1 electric car project. In 1996 he joined Delphi Corp., where he was vice chairman and chief technical officer until mid-2005. In 2009 Runkle became EcoMotors' CEO. He gets along well with the soft-spoken Khosla, who Runkle said has an intense curiosity about technology. Not two days go by, Runkle said, without Khosla e-mailing a suggestion or tip about potential funding sources or complementary technology he has noticed that could advance engine development at EcoMotors. Khosla also is adamant about managing risk. Rather than focus on the fastest path to growth, he promotes the hiring of experts who can identify risks associated with a project and work as fast as possible to make sure those risks don't trip up the plan. "Those unforeseen risks are the thing that can stall a project faster than anything," Runkle said. Each of the five auto-related companies in the Khosla Ventures portfolio, including EcoMotors, is in startup phase, and none has made a sale, Khosla said. 1. EcoMotors could build a plant and supply the engine to automakers. 2. It could license the technology to automakers or suppliers. 3. It could enter into a joint venture with a manufacturer to build it. Early testing has Runkle confident that the engine, which can run on either diesel fuel or gasoline, can deliver 1 hp per pound. Conventional four-stroke engines yield half to one-fourth that amount. In any event, Khosla said his investment firm is in for the long haul. The company's goal is to profit from the commercialization of new technology, not take profit out of existing companies. Runkle summarized his charge from Khosla: "The mantra here is build a multibillion-dollar company that supplies engines for the world."